I keep telling myself that new year's day is just another day, but I can't deny that there is something refreshing about starting over. I hope everyone feels much hope in this new season for new opportunities, second chances, and even for closures. 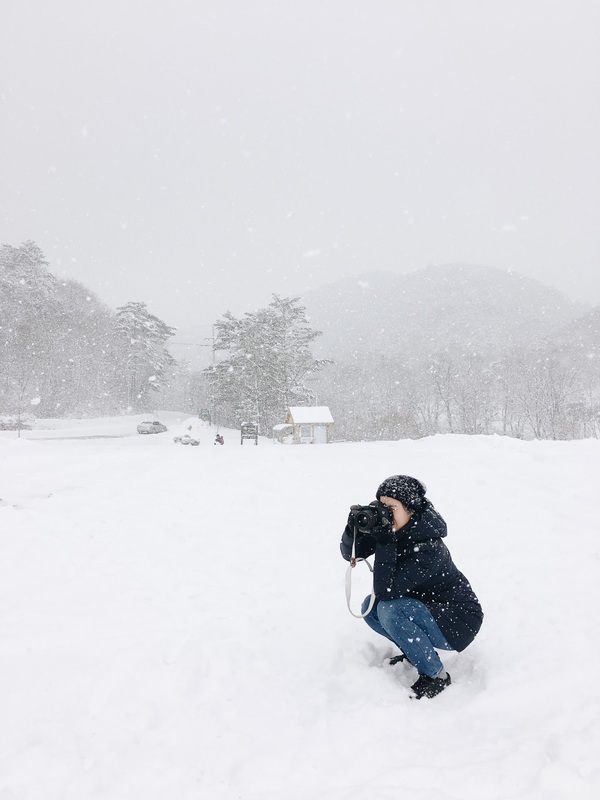 Pyeongchang, home of the 2018 Winter Olympics, is going to be my first blog post of 2017! 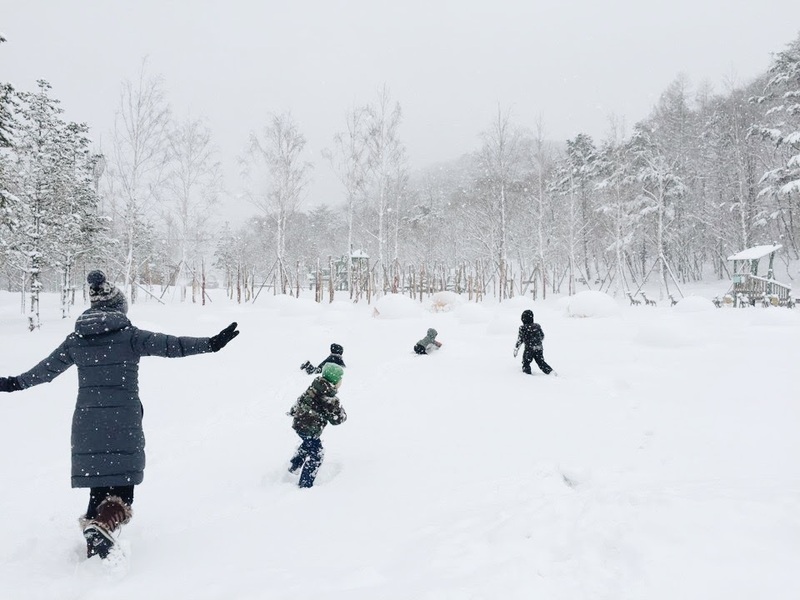 If you still haven't been to Pyeongchang, I highly recommended it for families all year around. 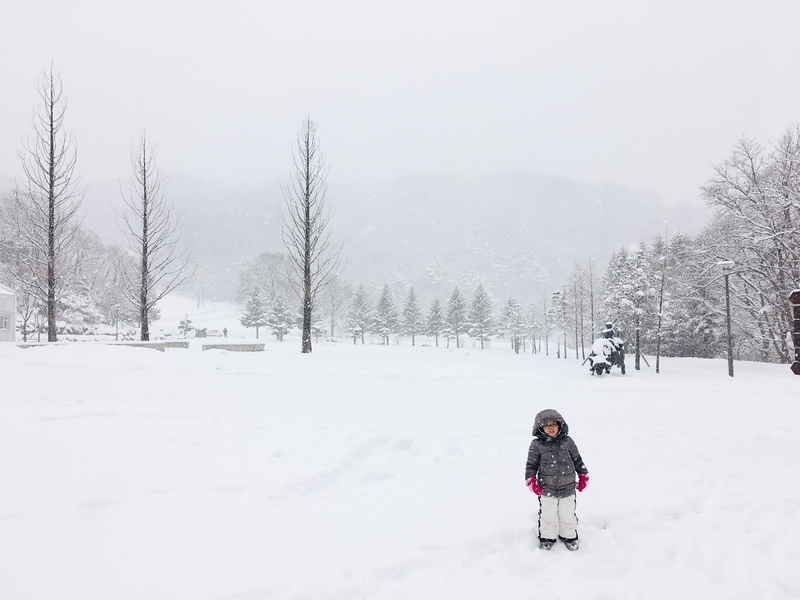 We just came back from a sledding trip in December and we visited there last summer end of June, so I will share our experiences both in winter and summer in Pyeongchang. 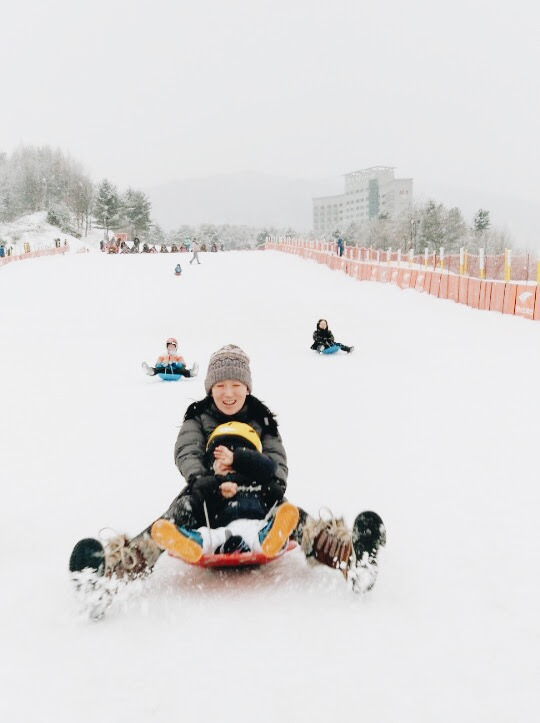 This past December, we went to Pyeongchang Phoenix Park Ski Resort. 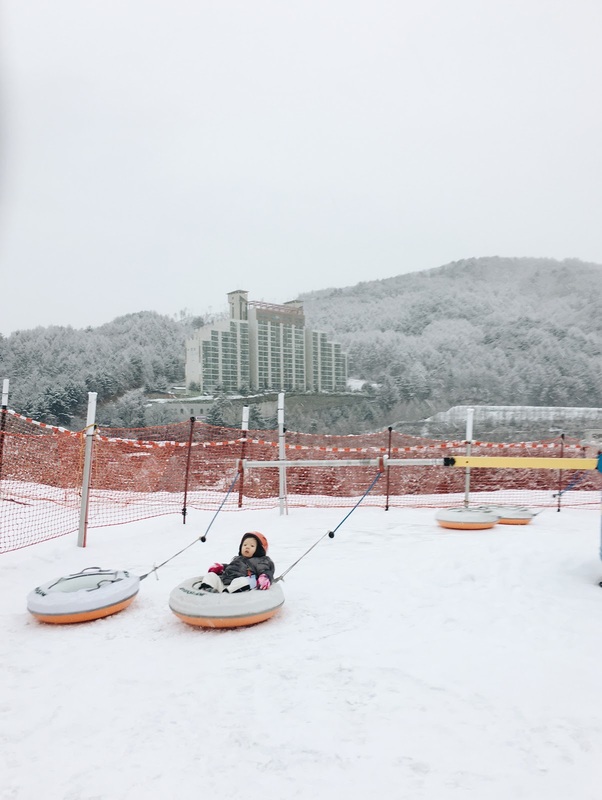 We stayed at Hanhwa Resort in a 3 bedroom, 2 bath condo. The condo was clean and big enough for 3 families to share, but you could tell the rooms and furnishings were getting a bit old. The bed in the master bedroom was broken, so we had to ask for extra blankets to sleep on the floor. They did not upgrade us or even offer to change our room for this issue. 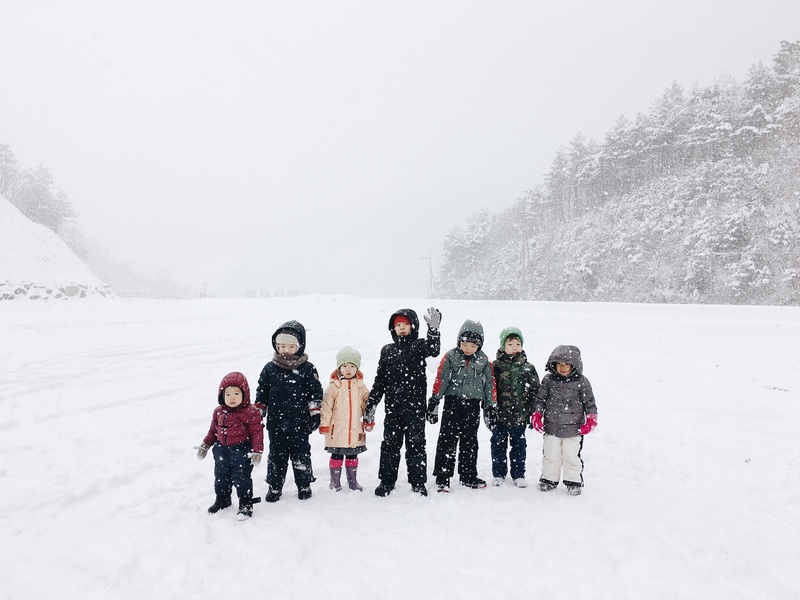 It was fine for us, since we did not expect 4-5 star hotel service and we were happy that they even let 3 families with 8 kids share one condo! Within the resort, there are restaurants, convenience store, arcade room, and shops etc. so you don't have to leave the resort if you don't have to. ***One tip when you are booking a condo here is that it's up to 50% cheaper when you book through a travel agency. 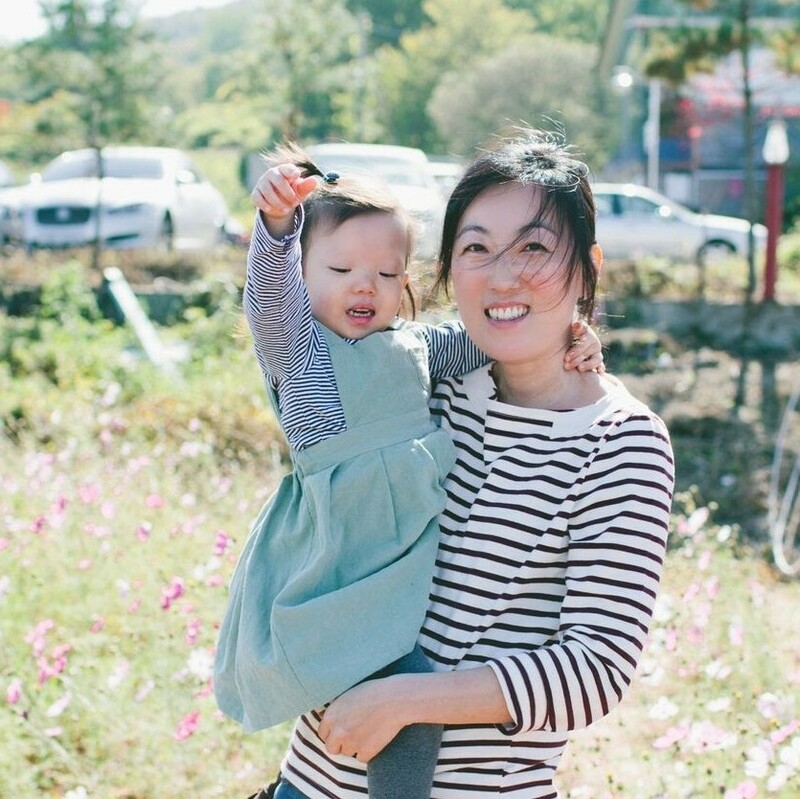 We had to call someone to help us book, so if you speak Korean or have a friend that speaks Korean it's worth looking into. Let's move on to the Phoenix Park itself since that's where we spent most of our time. Let me just remind you that we went with 8 kids ages ranging from 6 years old to 18 month old. We went straight to the sledding park for the kids and I was surprised how kid friendly the whole place was. First, I thought the size was perfect; not too big and overwhelming for the young ones and not too small where our older kids spent a good 2-3 hours having fun. And it wasn't crowded at all. Most people left around 5pm, so we felt like we had the whole place to ourselves in the last hour. 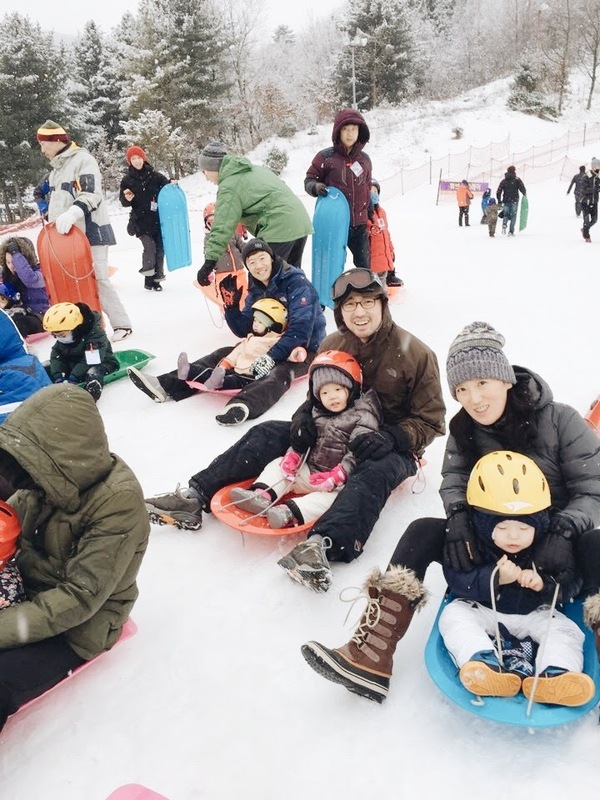 Second, there were a good amount of activities including sledding, tubing, lazy tubing, and a general play area. 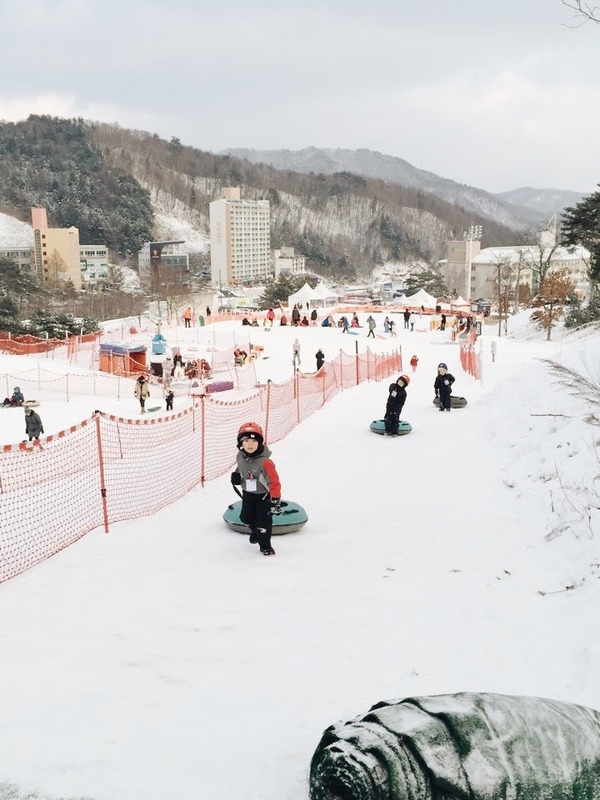 Third, it has a conveyor belt that took you from the bottom of the hill to the top which made it easy for us to transport young kids back and forth while our older kids just ran up the slopes to get there faster. 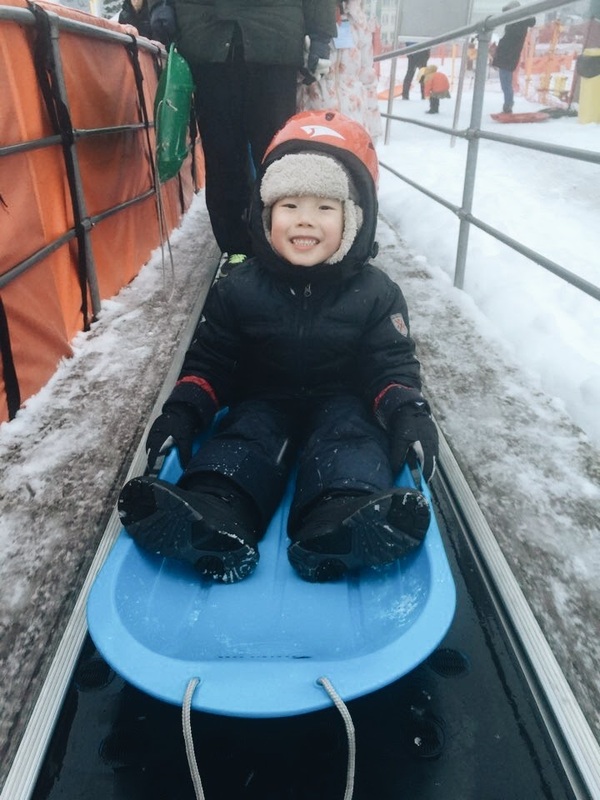 Our younger kids just sat on their sleds going up the conveyor belt, it was like riding another ride for them. Fourth, there is a restroom and small resting tent set up at the bottom of the hill with a few snacks available so you don't have to go all the way down to the main resting area. Lazy tubing...literally this machine spins you round and round very slowly. There were no lines for this, so our kids stayed on for 15 minutes at a time! They are open from 10am to 6pm. Prices are divided by 4 hour ticket/All day ticket. 4 hours Adult 17,000won, Child 15,000won. All day ticket for Adult 22,000won, Child 20,000won. Kids 4 and younger are free, but must be with an adult and not eligible for tubing. Overall, I thought the price was reasonable. 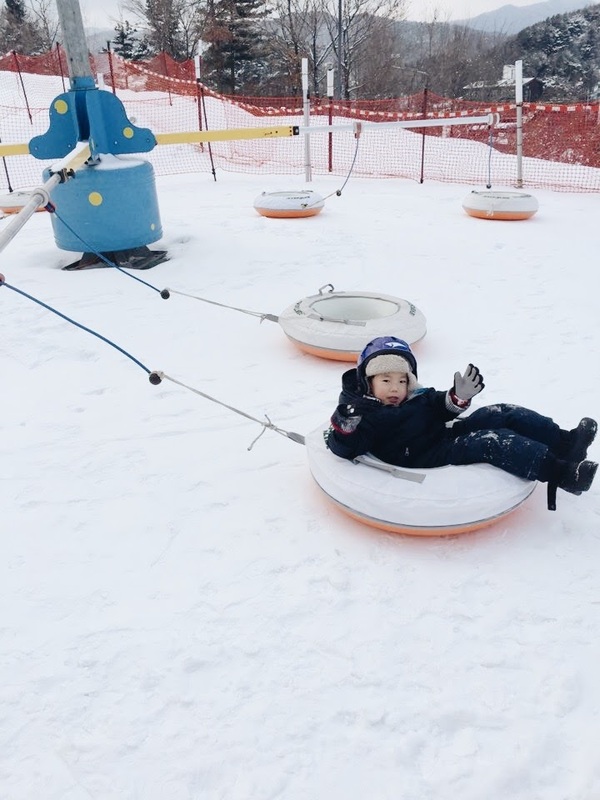 We saw many facilities offering different activities like indoor water park and kid's cafe that you might want to check out if you are there, but we decided to spend most of our time in the slopes and play outside in the snow. 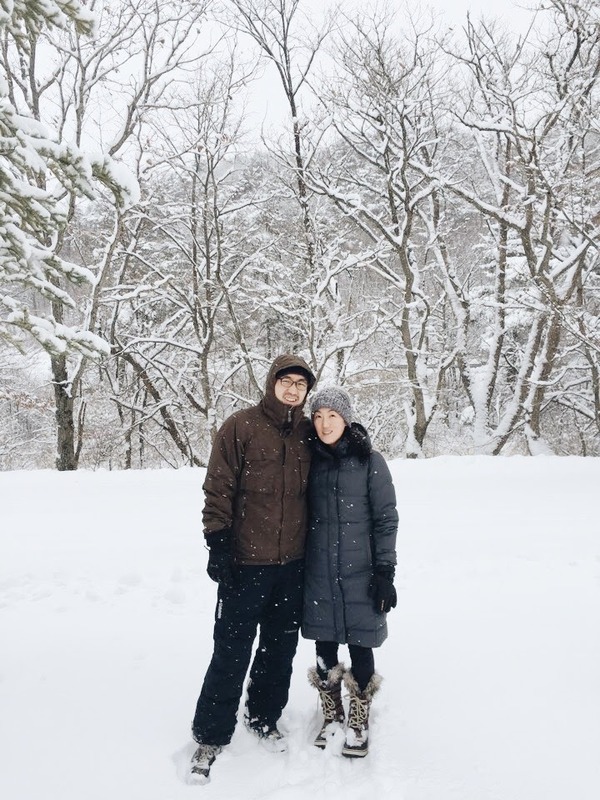 We were so happy that it snowed the majority of the time we were there! My photographer friend, Chloe who took my profile pictures. 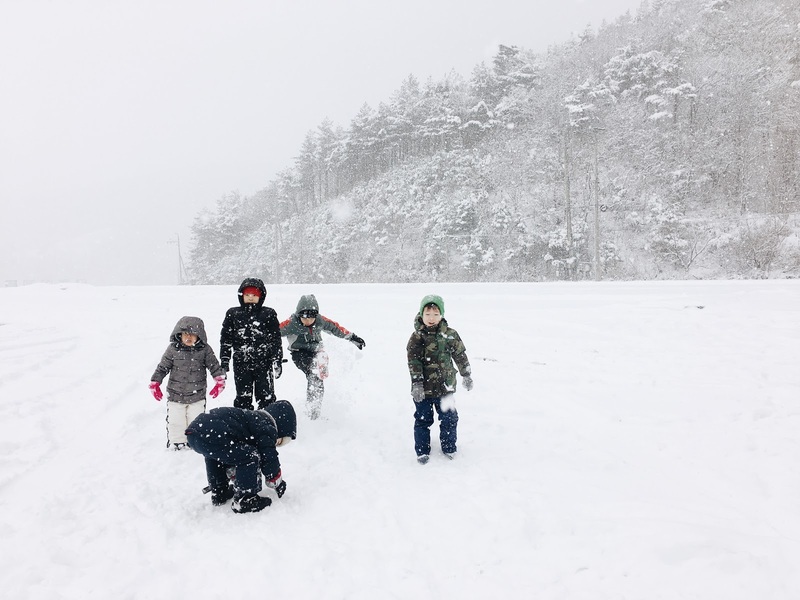 We loved playing in the fresh powdery snow! It was so beautiful! This was at Sky Ranch which I wrote more in detail on the summer post. Now where did we eat? 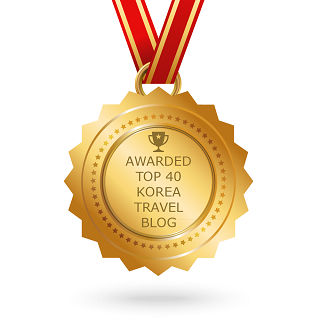 Pyeongchang is famous for buckwheat noodles and Hanwoo (Korean beef). There are ton of restaurants for these around the area and they are all good! So just want to share one place that we liked so much that we ate there twice during this tirp! It's called Songwon (송원해장국) 5 minute drive from Phoenix Park. I don't have any pictures of the food (Sorry, I am not good at taking food pictures. I just love eating them! 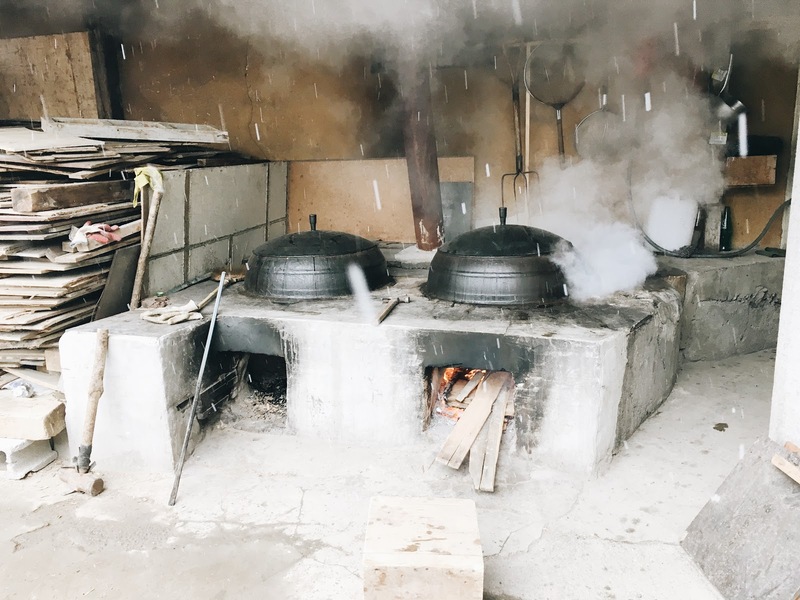 ), but they serve Korean soup that are cooked in these traditional metal pots. I love traditional home style foods in Korea, so if you like traditional style hot soups I highly recommend this place. Cost was only about 7,000won per person.